This Online Memorial has been created to commemorate the life of Eugenia Freeman-Wilcox. Leave a message on the Tribute Wall to share your favorite memories and offer words of sympathy and comfort. To send flowers or a remembrance gift to the family of Eugenia Freeman-Wilcox, please visit our Tribute Store. 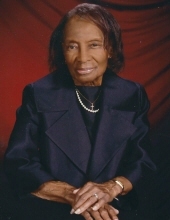 "Email Address" would like to share the life celebration of Eugenia Freeman-Wilcox. Click on the "link" to go to share a favorite memory or leave a condolence message for the family.